Me and Mine: "Honey, guess what?" When you're married to a redneck that statement is never a good sign. On Saturday afternoon Dave called and said those very words. "Honey, guess what...we're pig farmers now!" I said, "what??" ...Yep, we're pig farmers now. Dave and his brothers were driving around Dufur with 6 wiener pigs in the back of his truck. Thank goodness he only brought home two because I can't imagine what I would have done with 6! 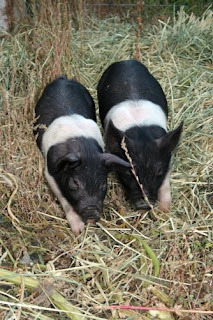 So I headed back to Redmond for the second time that day-- but this time it was to the feed store to figure out what in the heck I was going to feed the pigs. Thank goodness the girl was nice because she took pity on me and didn't laugh too loud. I found out that you feed pigs "Hog Grow" and it comes in 50# bags. My life will never be dull again. Too bad they are such cute little buggers because I'm already attached. Too funny! I can't wait to see how it all plays out! 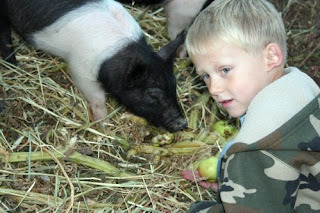 Those pigs are pretty darn cute!